Well, you’re sort of right, but if you remember, I said that marketing is everything before and after the sale except for the simple taking the money off the person. It’s as simple as that. As far as I’m concerned, if you do your marketing correctly, if you do it the way we do it, then the customer comes to you. It’s their choice, they want to come to you, and they want to buy. You’ve given them enough information that they’re ready to buy. That means, when they come along, you just simply have to say, “How many would you like?” and take their money. Now, after you’ve taken the money, there’s still marketing again. You’ve got to supply the goods. You’ve got to deliver them in a way. You’ve got to follow up. You’ve got to ask for referrals. You’ve got to check that they have enjoyed what they received, etc., etc., but there is that little element of asking how many they want and taking the money. For instance, someone can’t probably come into your store and say, “I’ll have a new kitchen,” and you say, “That’s $20,000.” and take their check. You probably need to visit their home and to measure up their kitchen to make sure everything is going to be just right. Let’s say that you’re a painter and decorator, or something like that, you may have to do something in advance, but is that person a surveyor or a salesperson? What is that person’s job? Personally, I would say that person is giving them a free survey, a free order. 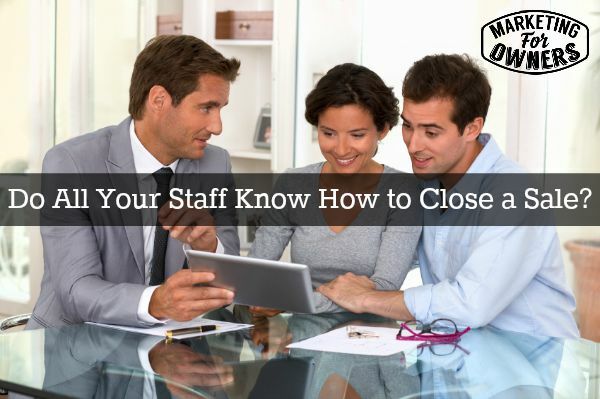 They’re not a salesperson, but they still need to know how to close a sale. So, at the end, if the sale hasn’t been agreed, you’ve done all this to get the customer this far. You have to have your surveyor then ask them for the order. Afterwards, he’s done everything, perhaps he gives them the price. He needs to take the order. So that surveyor needs to know how to ask and how to do it properly, how to answer objectives and things like that. So, do you see the difference there? Dealing with someone who’s already chosen your services, they still need to actually physically get the order. Other people could be your shop staff, your receptionist, the person who answers the phone. Can they take an order? Do they know how to voice it? Do they know how to look at the customer? Do they know when to smile? Are they nervous? Most people are very scared at asking for an order because they’re scared of rejection. They’re worried that the customer may say no, and they may feel embarrassed, whichever emotion it is, it doesn’t matter. Do you just assume that they will know how to do it because you can do it and you find it easy? This is the thing I find — that many business owners have had to go through the graft of talking to customers whether they like it or not and are somewhat used to it or more accustomed to it. It’s different when your money is on the line and it’s your livelihood, but someone who works for you who didn’t apply to be a salesperson who may still have to take an order, for example, customer service staff on the phone. But, have you explained this? Have you trained them or do you just assume? This is the worry that there’s too much assumption. We hire people to do certain jobs, and we just assume that qualifies them to do something else that sounds similar. If they’re answering the phone in customer services, surely they can take an order over the phone. Isn’t it the same? No. Not necessarily because it involves nerves, emotion, worry, all those things, fear of rejection. You have to explain, so this is what I would say, Consider every single person in your business that could possibly take an order or gets to speak to the customer, who may answer the door. Wouldn’t that be great if they could just say “Sure. Let me sort that out for you.” Or “Sure. Let me take you to somebody who can sort that out for you.” Don’t assume anything. Please provide sales training for that little tiny, little bit of selling that they may have to do. It doesn’t need any more than that because all your marketing is going to do the rest. Remember, they’re pre-qualified. Okay. It’s Wednesday, so that means it’s time for a Friendly Follow. Today is a very, very good one, and very unusual. This is Hugh McLeod. Hugh is brilliant. 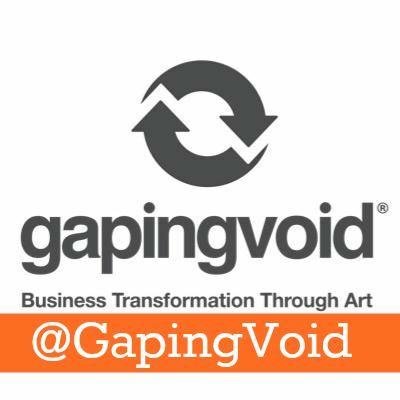 His twitter handle is GapingVoid, all one word, and I think they have quite a few websites. If you go to the twitter handle it, it will give you links to other ones because the empire has expanded. Gapingvoid.com, I think, is the main one. They provide business transformation through art. If you go to the website, their customers are huge, pretty much any big company you can think of, and the Twitter feed is just full of their images, but they have great interaction. They’re funny. The images, they would do sort of feel-good posters for work, encouragement posters for work. Specialist series of posters. If you wanted some specialist, humorous first aid posters or fire safety posters or something, they can produce that for you, but their Twitter handle is great, and all of their social media feeds because they’re very image-rich, and this shows what can be done when you have good images. Please go watch. GapingVoid, see what you can learn, and see if you can apply something to your social media channels. Remember, it’s not just Twitter. Look at their Twitter, check their blog, Facebook, Pinterest, Instagram, image-heavy, they may be good on those as well, so see what you can learn. I’ll be back tomorrow. Which of your staff do you need to train to help in sales?